It was the year 1960 and I‘d decided to further my education in accounting. It had been a hard decision to return to school. My career with the public accounting firm of A H Leitch & Son was on track, and it was tempting to stay on board and rake in the cash each week rather than go back to school. In school money flowed out, and there was little time for the better things of life. At work money flowed in, and you partook of the joys of life after work. That should explain my dilemma as I thought about taking off two years for further study. However there were always evenings after library had closed; a time when boys are longing for the joys of life placed temporarily on hold. At that time of night it was impractical to take a hike to the village some distance from campus and its student housing. That meant entertainment, such as it was, would have to be found within a reasonable distance of our campus. Now many entertainments had been sampled, from placing mossy logs in beds of those who were foolish enough to be visiting other rooms after lights out, to placing empty cans at the top of stairs to wake those sleepy souls transiting the hallways in darkness. Another fond memory is of exploding fireworks in the downstairs cement bathroom area after lights out. Good echo! Our rationale of course was a pure one in that era when fireworks were permitted. One obnoxious student customarily used bathroom nightlights to study, and insisted on verbalizing loudly what he was attempting to study. The explosion and smoke usually convinced him it was time to sleep. Some of my close friends were handy with light and sound. They’d figured out how to adjust the student housing PA system to play Elvis music at the stroke of midnight, much to the horror of our Dean who thought Presley the personification of all evil. They had the good sense to reverse their ingenious wiring before a predictable room to room search next day. My room mates were electricians by trade before venturing back into higher education. They managed to rig the electrical system so when regular power was turned to night lighting they could reverse procedures by the flick of a switch in our room. This trick would send our Chinese Assistant Dean into fits! This would also initiate room searches, but my electrician friends were able to dismantle their creative work quickly and remained at large during the two years we were there. My room mates soon tired of that, and began to experiment with a concoction which I think was a vial of glycerin, placed to upend and pour onto crystals when a door was opened. Their first experiment was on me, and on opening my door the resulting blast tested the absorption qualities of my underclothing. The blackened wall had to be explained of course, but I never ratted on my room mates and the incident remained unsolved. 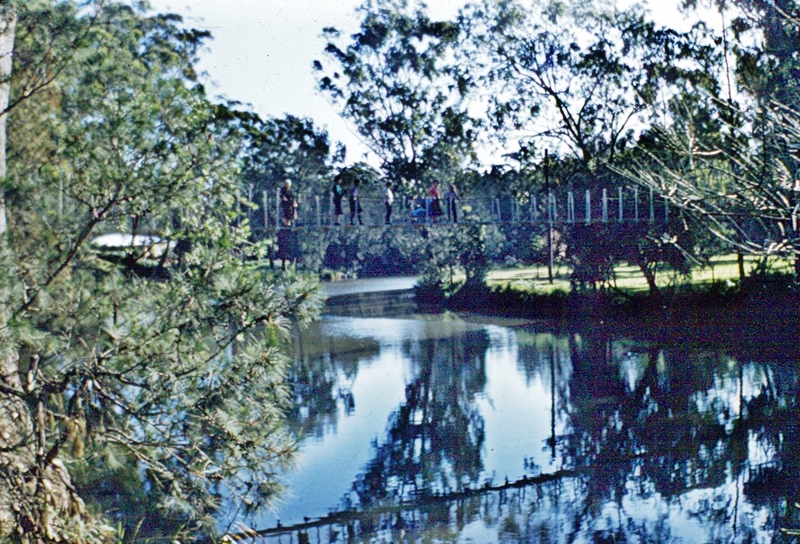 But the classic of them all, remembered fondly by a gang of four even today was a midnight incident down at the swinging bridge over Dora Creek. It had come to our attention fisherman from the township of Dora Creek would come stealthily up to the factory by the creek of an evening and net fish feasting on factory waste being emptied into the creek. Now we understand today emptying waste into our waterways is a no no, even if fish grow fat on healthy drainage. We did not understand that at the time. But we did understand these fishermen were netting undersize fish, and even in those days this was a no no. Something had to be done about it! So four of us waited on the swinging bridge one fateful evening watching kerosene lamps positioned in the centre of fishermen boats approach slowly. They had to cross under the bridge to reach the netting area. By our sides were buckets of factory waste products which the students had named “bog.” The name will give you some idea of how we students viewed the contents. As each boat reached optimal launching point contents were emptied into each with a loud friendly salutation, “blessings from heaven!” Lamps went out, oars were lost and we were entertained with the most colorful language ever heard on that campus. Our mission accomplished we quickly retreated to our rooms, and slept the sleep of those who had done something positive for society. The next day was assembly time for college students. A visibly angry President entered stage flanked by two very official looking gentlemen in police uniform. The President railed on the assembly demanding those responsible for attacking innocent fishermen the previous evening immediately come forward. Of course no one responded, as it just wasn’t the right setting at all. While the administration tried for weeks afterward to break the code of silence surrounding this event and bring criminals to justice, that event too remained a mystery until this day. With the protection of statute of limitations I’m sure the rest of my co-conspirators would be happy to step forward today. Unfortunately I was Esther. It took me a bit longer to mature than most and perhaps there is still too much mischief in me still. LOL. Those were the days…fond and funny recollections. Thank you Ian, enjoyed this read. Such pranks lapsed with their parents – my generation – I reckon.